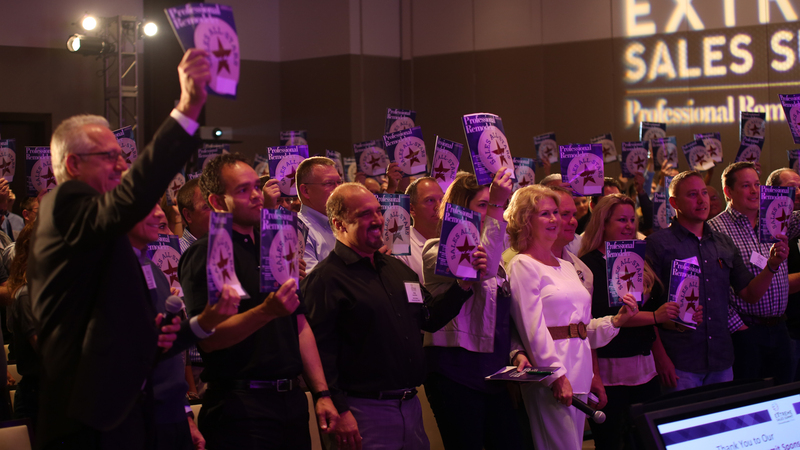 Professional Remodelers' Best of the Best Award winners showcase the best designs and quality construction in the remodeling industry. 2007 Best of the Best Design Award Judges: (Left to right) John Habermeier, Synergy Builders; Daniel Griffin, Griffin & Associates; Scott Sevon, Sevvonco; David McNulty, McNulty Design Group; Dave Clark, Stebnitz Builders; and Mark Fox, Gardner/Fox. While the remodeling market may be slowing, this year's Best of the Best Design Awards competion shows that homeowners are still willing to pay for what they want. That was probably the biggest trend in this year's award-winning projects, as clients consistently spent money to stay in areas they liked rather than move to a new location. Upscale features were the norm as homeowners looked to create more space and a home that reflected their personalities with unique designs. With a record 235 entries in 20 categories, this year's competition was the most competitive ever. Entries were judged on construction quality, creativity, design and problem solving. A total of 56 projects won awards, including 16 Platinum Awards and one project chosen by our judges as The Best. For a list of our Gold and Silver winners, click here. categories, this year's competition was the most competitive ever. Entries were judged on construction quality, creativity, design and problem solving.With a record 235 entries in 20 categories, this year's competition was the most competitive ever. Entries were judged on construction quality, creativity, design and problem solving. Rebuilt from the ground up, this Craftsman-style home was constructed to demonstrate the merits of green remodeling techniques and materials. The exterior features durable, engineered finish materials that require little upkeep. The home's rear elevation is designed to maximize the views offered by its lakeside site. After photos by Sylvain Côté. For remodeler, Sylvain Côté who says he often draws on his background in art and visual photography for his work, this whole-house renovation in South Salem, N.Y., is his masterpiece. Reconstructed on the octagonal foundation of a home that was originally built in 1983, this thoughtfully redesigned and skillfully crafted 3,750 square foot lakeside home is as functional and environmentally friendly as it is pretty to look at. Côté says that one of the driving factors behind this project, which is actually his own house, was to demonstrate the merits of green building to his local market, which he believes has been slower to embrace the concept than other parts of the country. "I really became inspired by the practical sense of it after attending a workshop in Austin, Texas, back in 2004," he says. "From a marketing standpoint, I recognized that this is the perfect time for a project with this focus in my area. But the reality is that it goes much deeper than marketing. Green building is not a trend. It is here to stay." Rebuilding the new, Craftsman-style home on an existing foundation provided the remodeler with both economic and green reuse benefits, Côté says. By building up rather than out, materials cost less, he says. He had the existing home removed down to key floor joists on the foundation, salvaging any materials that could be reintroduced into the new construction, including 10 of the home's 12 original rafters. He also preserved the massive stone fireplace and chimney that serves as the main load-bearing support structure for the roof of the uniquely shaped home. The chimney was extended an additional 15 feet to accommodate the home's new upper level. All stones were reclaimed from the existing home, ensuring a perfect match. Raw, but not virgin, and reclaimed materials were used for the home's interior finishes. Beams on the lower level are Douglas fir with a wire brush finish. Heart pine beams on the main level were salvaged but had to be re-milled because they were different sizes. The wood flooring was also reclaimed and included mixed pine, chestnut and hickory. The massive fireplace provides a focal point for the interior spaces. "Reconstructing the roof was definitely an engineering challenge," he says. "It was much more difficult than we had initially thought." But the results are spectacular. With no interior load-bearing walls, the home features an open floor plan that can be easily modified to accommodate future changes in lifestyle requirements or to improve accessibility. Engineered materials were used on the home's exterior to provide better durability and make it easier to maintain. Interior finishes include raw and reclaimed materials such as wood, wrought iron and stone, as well as a natural earth plaster finish on the walls. Other energy-saving features such as radiant heating; Energy Star-rated appliances; LED, CFL and halogen lighting; and two heat recovery ventilators were also part of the project. "In addition to all of its green features, this home's unique layout simply adds another dimension to its appeal," says Côté. The staircase structure mimics the shape of a flowng river, and its open design permits natural light to flood the interior of the home. Alder was used throughout the project with the exception of the floor, which is hickory. Remodeler: Sun Forest Construction, Bend, Ore. Designer: Tozer Design Studio, Bend Ore. Interior designer: Siri Design, Portland, Ore. Purchased for its beautiful riverside location rather than the 1980s-inspired contemporary character of its original design, the owners of this house in Bend, Ore., had a plan in mind for the home when they bought it. Their goal was to completely remodel it, inside and out, in a style that would celebrate its bucolic Pacific Northwest location. Although the home was in need of a major renovation, local land management controls — which prohibit enlarging houses in environmentally sensitive, waterfront locations — limited the couple in what they could do. "These restrictions are really the impetus that drives the residential remodeling market in this area," says Mike Montgomery, remodeling manager for Sun Forest Construction, which the client hired for the project. "Land use regulations today do not allow new construction to be as close to the river as in the past. Because of this, there are a lot of people buying older homes, with the intention of remodeling them, just so they can be closer to the river. The major requirement, however is that they work within the existing footprint of the original structure." The homeowner wanted to remodel the home using a palette of natural materials that would blend with the rustic surroundings and enhance the view of the river from inside. "They really wanted to feel as though they were right on the river when they were inside the home," says Montgomery. "The redesigned interior gives you the feeling that the space just flows outside." A local artisan was hired to custom-craft cast metal panels for the refrigerator doors and fireplace surround. The swirling patterns integrated into the panels resemble a flowing river. The 10-month-long project involved extensive interior demolition work, the remodeler says. "We did reuse some of the original framing, but that was about all." The clients worked closely with both the project designer and the construction team throughout the remodeling process to select materials and finishes that would lend themselves to the look and feel they wanted to achieve. Other updated elements included a new HVAC system; rewiring of the electrical system; reconfiguring the plumbing; refinishing the interior walls, remodeling the kitchen, bathrooms and existing staircase; and replacing all the windows. The entire house was re-roofed for aesthetic and structural benefits. The only new livable square footage that was added, says Montgomery, was a media room that was converted from part of a garage space. The homeowners, who use this as their primary residence, truly consider it their "home of a lifetime." Remodeler: CASE Handyman & Remodeling, Anoka, Minn. The whole house remodel of this '70s rambler in Edina, Minn., transformed the home's interior living spaces from passé to sleek and Asian contemporary. That's thanks to new fixtures and finishes and an expanded floor plan that works better for its owner's on-the-go lifestyle. "It was a very dated house in terms of style and function," says remodeler Bob Mock, who owns his own remodeling firm based in Anoka, Minn. The client, one of his past customers, wanted to remodel her home's front entry, kitchen, mud room and living room and add a bathroom and pantry. The project also involved replacing all windows and doors. To expand the space in the kitchen, interior walls were removed between it and the adjoining living and dining rooms, which required creative framing to accommodate an existing ceiling header. In addition, the main furnace flue was rerouted into a void in the wall between the kitchen and the new bathroom. This made it possible to replace the solid walls on either side of the staircase with a pair of open lathe walls, which are visible from the new entry foyer. The open-wall design surrounding the staircase fulfilled the client's desire to eliminate the closed-in feeling associated with an interior hallway. Other improvements included removing outdated decorative beams from the family room ceiling and re-building the home's "beehive-style" fireplace. Custom-built riff-cut white oak cabinets with overlay curved doors were incorporated into the remodeled kitchen, giving it a very sophisticated appearance. New white oak flooring was also installed throughout the home. The curved doors on custom-built white oak cabinetry in the kitchen feature a dramatic horizontal grain pattern which was emphasized by the staining process. The expanded kitchen features an oversized island workspace with an engineered countertop that doubles as an eating area. "We actually opened up four different walls in the home," says Mock. "It was a tricky process to transfer the loads on what was a hand-framed roof." Some of the finish materials that the client selected for the project had to be specially ordered, including upgraded white oak interior doors and custom limestone tile used in the kitchen, bathroom and fireplace. This extended the length of the overall project by nearly a month, the remodeler says. "The homeowner had very strong ideas about how she wanted the remodeled spaces to look, but it was hard for her to articulate these ideas upfront," says Mock. This caused several mid-project changes that slowed progress but did not create a negative working relationship with the homeowner. "Actually, she was a great client to work with because she was totally realistic. She knew what she wanted and was willing to accept delays if it meant achieving her desired results." The home's Japanese-inspired entry is serene and peaceful. Translucent exterior panels custom-built to mimic shoji screens, on the left, provide the perfect complement to their real counterparts on the inside. Although she had already been advised by three architects to tear down her modest, 56-year-old home in Lexington, Mass., rather than remodel it, the owner knew her house was something special, and she was determined to preserve it. Peter Feinmann, president of Feinmann, an award-winning design/build remodeling firm based in Arlington, Mass., thought so too. The home was originally designed and built as part of a neighborhood of experimental houses in the early 1950s using the Deck House style of architecture, which was based on modernist simplicity and post-and-beam construction techniques. Feinmann's client, a university professor of Japanese sociology, wanted a multi-use addition onto her home that would serve several functions. This included a more architecturally significant entry, a spacious home office and a serene sitting area. "Our inspiration for this project came from an off-hand comment that she made during one of our preliminary meetings with her," says Feinmann. The homeowner mentioned that she had always wanted a Japanese "scholar's study," which is traditionally a contemplative workspace enclosed by shoji screens. "As we explored this idea, we realized how similar this concept was in appearance and inspiration to the actual style of her home. We recognized that we had a great opportunity to do something really special here." The shoji screens are made of a laminated material that will withstand abuse from the homeowner’s cats. The screens can be drawn to enclose the “scholar’s study” which doubles as a guest room. The design for the new addition features post-and-beam construction that continues outward from the existing house, preserving the continuity of its original design while creating a brand new "Japanese" wing that includes all the elements the client was looking for, as well as a single-car garage. Feinmann's design team researched materials that would complement the design's balance of Eastern and Western architecture. They discovered a translucent sandwich panel material typically used for commercial installations that they could customize to create a shoji-style window for the front elevation of the addition. "It was just what we were looking for," says Feinmann. The product had the same insulating properties as a typical exterior wall but allowed light to shine through it. "We now could bring light into the space without sacrificing privacy. And it was no more complicated to install than a conventional glass window." Another challenge that Feinmann faced with this project: his client left the country to spend six months in Japan shortly after the design process began. "But we still had to continue working with her even while she was gone so that we would be ready to begin construction as soon as she returned." Meetings were conducted over the phone or using the Internet. "The result is a unique space that exceeded our client's expectations." The home’s new Craftsman-style front elevation features a well-balanced design that draws the eye to its focal-point entry. Remodeler and Architect: Landis Construction, Washington, D.C. When the owners of this 52-year-old home in Kensington, Md., decided it was time to update its front elevation, the couple's No. 1 priority was to add a front porch that would improve its curb appeal and provide them with a sheltered outdoor living space their house was lacking. With the help of his design and construction team, Washington, D.C.-based remodeler and architect Chris Landis gave the home a new streetscape that exceeded his clients' expectations, transforming their dated rambler into a true neighborhood gem. "The change is really remarkable," says Landis of the home's new Craftsman-inspired facade. It now features a deep, full-width covered porch with ample space for a table and chairs accented by a prominent gable that's supported by a quartet of battered columns. The primary challenge of the project was that the house had two front doors: a formal entry at the mid-point of the home but invisible because it was turned parallel to the street; and a second door, next to the driveway, that opened directly into the kitchen. This lack of a clearly defined entrance was both aesthetically unappealing and constantly confusing visitors, says the project's designer Garth Russo. Russo's solution was to eliminate the informal entry, replacing it with a window to bring more light into the kitchen, and to face the main door toward the street. The single gable of the new roofline emphasizes the home's new entrance — the focal point. The deep front porch provides the homeowners with the outdoor living space they were looking for and includes both recessed lighting and Prairie-style sconces. The porch ceiling features a tongue-and-groove fir finish. Landis' clients were also keen on using green materials and practices for their new porch, says project manager Andrew Kerr. "They had already decided they wanted to use Lyptus for the porch decking." Lyptus, a hybrid of the eucalyptus tree, is a plantation-grown, sustainable wood that matures quickly and resembles mahogany in color and grain. "It's not a true exterior product, but we did our research and found that we could use it because it was a covered application. We also treated it for increased weatherproofing," adds Kerr. Other materials included Forest Stewardship Council (FSC) certified eastern white cedar shingle siding and trim, as well as the home's original brick accent siding that was salvaged and reused on the base of the new porch columns. The materials and color palette introduced on the front of the home were carried to its other elevations for continuity. "We wanted to give the front of the house a facelift, and, at the same time, tie these dramatic changes into its existing side gables so that everything made sense visually," says Russo. "This project was extremely successful in transforming the overall look of the house." A pergola-style roof adds character to the exterior of the Pacific Northwest home without creating too much shade for the new outdoor entertaining space. After purchasing this 15-year-old, Pacific Northwest beauty in Bend, Ore., its new owner wanted to improve upon the home's visually striking, but worn, Craftsman-style exterior character and, at the same time, increase his opportunities for sheltered outdoor entertaining. Perched on a heavily wooded, rocky outcropping, the home's rear elevation had a fantastic overview of the community golf course. "He really wanted to add some richness and texture to the home's exterior as well as a sheltered deck that would not impact his view of the golf course," says Mike Montgomery, remodeling manager for Sun Forest Construction, the local design/build firm that had originally built the home. The design for the project involved matching the 1,000-square-foot extension of living space to the exposed log structure of the home. A new gated entry needed to blend as well. A view from underneath the spa roof demonstrates the skilled craftsmanship that went into the project’s joinery. Other exterior improvements included replacement of the windows with commercial-grade, tinted ones; adding copper gutters and downspouts; repainting the original siding; replacing all of the home's French doors; and adding a new snow-melt driveway, walkway and rear deck. When it came to developing a plan for the new deck, the homeowner wanted to avoid an architecturally heavy patio structure that would require so many posts that it could obstruct the views out of the back of the home. "It was also important that the new structure allow light to penetrate into the interior living spaces," says Montgomery. Getting the necessary construction materials — primarily large logs — to the site presented the remodeling team with a significant scheduling challenge. Community regulations dictated there would be only a one-hour window in the early morning for deliveries. "And we could only use a small crane during that same hour for unloading," he says. Matching the new logs to the original wood on the home also had to be addressed, the remodeler says. "We ended up sandblasting the new wood as well as all of the existing beams, logs, exposed overhangs and natural wood on the house so that everything had the same finish." The real beauty of the project is the craftsmanship that was involved in assembling the new log structures, Montgomery says. "All of the joints are hidden. Everything was done so seamlessly that none of the connections are visible — even in the places where the posts are joined to rock. The results are amazing." Remodeler: Lewis Aquatech, Chantilly, Va.
Landscape architect: Donovan Feola Balderson & Associates, Montgomery Village, Md. When the owners of this upscale residence in Washington, D.C., decided they had outgrown their home, they initially explored the possibility of moving. They soon realized, however, that they loved their current location — a heavily wooded, very private site on the northwest side of the city — too much to leave it. Instead, the couple elected to update their living arrangements with a $500,000 addition and a back yard remodel that included new hardscaping and a dramatic new pool. The home's former outdoor living space included a large elevated wood deck off the main body of the house and a conventional, rectangular in-ground pool and gazebo at the rear of their lot. A lawn separated the deck and pool area. "It was fine for its day, but it was definitely in need of updating," says Donald Gwiz, vice president of marketing and sales for Lewis Aquatech, a local construction company hired by the homeowners to reorganize their outdoor amenities. The company, which specializes in creating outdoor environments, had also installed the original pool for the clients. Water cascades over the pool's infinity edge into a recirculation pond. A new site plan was developed for the rear yard permitting the outdoor living space to work in concert with the home's grand new addition. A multi-level flagstone terrace with planting beds, a Carderock stone fireplace with its own sitting area, an outdoor kitchen and a direct, hard-surface connection to the pool replaced the wood deck. The new pool now runs perpendicular to the home. This created very dramatic sight lines that run from inside the home to the pool and beyond, culminating in a sensational, infinity-edge waterfall that complements the contemporary, nature-inspired design theme of the project. Construction access to the back yard was a challenge, says Gwiz. "There was literally no way to get back there except through the adjacent property. The neighbors were very generous in allowing us to install a temporary construction road on their lot so that we could access the site. It was really a remarkable partnership between neighbors that you don't always find these days." Lewis Aquatech implemented a fast-track, six-month construction schedule for the project to minimize disruption for the families involved. "Our clients are thrilled with their new outdoor living space," says Gwiz. "Not only does the yard work much better for them in terms of function, but it has really enhanced their new addition as well." This award-winning outdoor living space serves as an alfresco kitchen and a sheltered entertaining area for a homeowner who is both an avid chef and a local general contractor with a discriminating eye for good design and high quality materials, says remodeler Wayne Magee, owner of Magee Construction in Cedar Falls, Iowa. 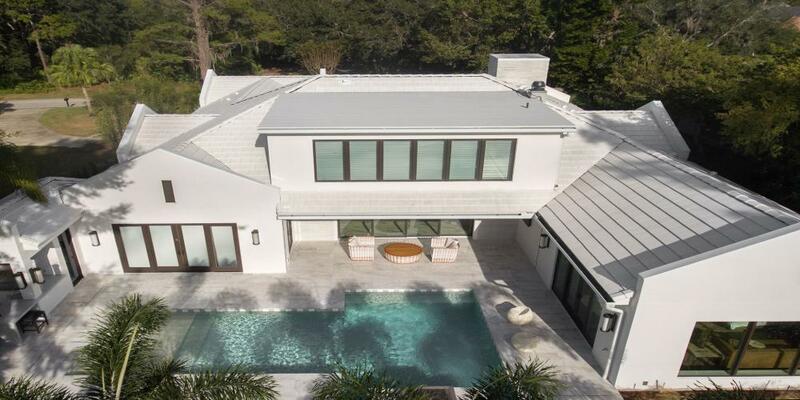 Cooking facilities, a conversation area and a multi-level wet bar are all contained beneath an architecturally distinctive roof designed to complement the home's contemporary style and protect from the elements, says Magee. The new addition blends in form and function with the home's existing 1,110-square-foot cedar deck. Radiant heating in the outdoor room's concrete floor extends its season from early spring to late fall. During the day, six skylights flood the outdoor room with natural light. The skylights are vented and remain open most of the time, Magee says, to permit excess heat to escape, as well as to prevent the buildup of odor and smoke when the grill is in use. Sensors automatically close the overhead windows at the first sign of rain. A grid-style sidewall adds an element of privacy for the interior of the outdoor room, shielding it from direct view of the adjoining property without closing in the space visually. The grid detail also made it possible to design the space with strategically placed, but invisible, electrical outlets and switches that make the room function efficiently. Recessed and task lighting incorporated into the room's decorative ceiling beams provide extra light for overcast days or evenings. The kitchen area is designed and equipped to facilitate the preparation and service of meals entirely outdoors and includes a host of high-end, stainless steel appliances, including a 54-inch grill, a refrigerator, an ice box, double burners, an oven, a warming drawer and custom utensil trays. A multi-level island/wet bar, which features custom-built mahogany cabinetry suspended on a steel tube frame, serves as the focal point. Achieving the rich black color specified for the room's site-formed concrete countertops proved to be one of the most challenging elements of the project, says Magee. "We really had to get everyone on board with just how critical the finishes were to the success of the space." Demand for outdoor living space is moving north into housing markets in a big way, says Magee. "We have more clients interested in adding them all the time," he says. "No matter where you live, everybody likes to be outdoors. Some people are a bit surprised by the costs involved, but the reality is that outdoor rooms can be as elaborate as their indoor counterparts." Remodeler and Architect: Normandy Builders, Hinsdale, Ill.
Masterfully planned and beautifully executed, the three-season room addition blends so well into the rear elevation of this 3,500-square-foot French Country-style residence in Hinsdale, Ill., that it is hard to believe it was not always a part of the home. The style and scale of its architectural details and finish materials so seamlessly match the rest of the home. The room's modest 8- × 10-foot size, however, belies the complexity of the design process required to make it happen, says project architect Troy Pavelka of Normandy Builders. Zoning requirements in the upscale community strictly regulate home size based on a percentage of lot coverage, and the existing home was already very close to that limit. "According to the local zoning commission, the home could not take up any more than 25 percent of its buildable site," says Pavelka. "This meant that we were restricted to a footprint of only about 65 square feet for the new space. The reality is that we were really lucky to be able to get an addition in there at all." Recessed and indirect cove lighting incorporates into the room’s barrel vaulted ceiling. Radiant heating within the travertine tile floor and storm windows that replace screens extend the space’s usable season for the homeowners. Recognizing just how important the room was to the client, Pavelka says the goal of his design was not only to capture every square foot of living space as possible, but also to maximize the visual impact of the room's interior. "I really looked at the room from every plane and packed it with as much as I could." The architect came up with a unique solution that allowed him to gain an additional seven square feet inside the room. "We were able to cantilever the dominant wall, which was the rear wall that contains the dormer, out over the foundation. The finished living space actually overhangs the foundation by nearly a foot." Visual cues taken from the home's exterior elevation were used to create the design for the addition, says Pavelka. "The most obvious one was the large barrel dormer that was incorporated into the existing hip roof. We created a smaller version of that for the sunroom." The home's existing rooflines were also extended. Inside, a barrel vaulted ceiling raises the ceiling height in the space to nearly 11 feet, expanding the room vertically while windows on three sides do the same on a horizontal axis. "This room is really deceptive," says Pavelka. "For a small space, there is a lot of big design going on in there." Architect: Insight Architects, Charlotte, N.C.
Remodeler Larry McAllister is quick to share the credit when it comes to identifying what made the renovation of this century-old bungalow in Charlotte, N.C., such an overwhelming success. "Having a great architect on board and a great client makes all the difference," says McAllister. He should know. His 10-year-old firm has a solid reputation for high-quality restoration work in the greater Charlotte metropolitan area. "Getting approval from the local historic zoning commission can be a tricky and time-consuming process. Typically, a project has only a 25 percent chance of gaining approval from the board the first time through. Sometimes this can take months." Not so for the proposed renovation of this 1,200 square-foot home in the city's highly desirable uptown district. The plans, developed by local architects John Shurley and Vince Ciccarelli, were approved the first time through, says McAllister. Their design called for more than doubling the home's square footage with a rear addition, an upper floor and an attached garage. New spaces included a large family room, additional bedrooms, a home office and an updated kitchen. The chimney for the home’s existing coal-burning fireplace was rebuilt and a gas-fired coal basket insert was installed to replace the original. The new surround and hearth features a tumbled marble finish. The fireplace’s original mahogany mantle was refinished on site. "The real beauty of this project was that the house had a lot of nice historic elements to it already," says Ciccarelli. "These provided us with a good starting point in terms of the design. Another really important fact was that the clients, who had purchased the home several years earlier with the goal of restoring it, accepted the bungalow style and were willing to allow us to focus on that rather than on appealing to their specific tastes. They encouraged us to detail the house appropriately." Period-specific accents include wavy glass, mortised door handle sets, salvaged heart pine floors and Arts and Crafts-style staircase railings. The house was in bad shape, says McAllister. "It really had very poor bones, so it required a lot of retro-engineering on our part." For example, the remodeler discovered during demolition there were no footings underneath its brick walls. Taking advantage of an unpaved rear access lane and the natural slope of the lot, the architects integrated the garage into the main body of the home's rear elevation. "This was really a tight site," says McAllister. "And we pushed the lot coverage to the maximum buildable footprint. Everyone involved with the project made sure that their work was near perfect, and the architect did a heck of a job preserving the original cool character of the home." Remodelers updated the basement fireplace with a new tile surround that complements the other finishes in the room. Architect: Charpentier & Chen, P.C. The synergy between old and new in the remodeled basement of this proper Georgian-style residence in Richmond, Va., exudes the eclectic charm of a downtown loft, taking the homeowners' entertaining options to a whole new level. "Their goal," says Certified Remodeler Robert Wright, "was to capture unused space in their home and create a totally unique area for relaxing." Wright's clients had in hand design sketches for a new floor plan for the basement, which had been previously remodeled to include a bedroom, full bath and recreation room. The plan called for reorganizing the space and opening it up by removing all of the existing interior walls, none which were load-bearing, with the exception of those separating the living area from the bathroom and storage space. "My clients were looking for a very modern, urban look for the finished space in their basement and had also brought us clippings of ideas they liked," says Wright, owner of the Richmond-based remodeling firm Cabinetry and Construction, responsible for the 1,000-square-foot project. "We're typically involved in very traditional projects, so this was something new for us. But it was an interesting challenge and we were excited to take it on." The steps leading up to the main level of the home were redesigned to resemble a front door rather than a stairwell, says remodeler Robert Wright. The display niche adjacent to the staircase features glass shelving and contemporary stainless steel track lighting. The new space features a striking focal point fireplace and a stylized corner bar with custom-built bamboo cabinets and a concrete countertop backed by a glass block window. The tile for the bar was chosen to complement the new surround for the room's existing fireplace. Wright worked closely with the client in selecting the color scheme and materials for the project. The unique blend of textures and finishes combining with elements that were already there is what really gives the space its unique character, Wright says. The basement's existing foundation walls were power-washed to partially remove their previously painted finish, giving them a custom, distressed appearance. The ceiling joists were also left exposed, as were the two main structural steel I-beams. All ceiling elements were painted a soft charcoal black to make them less conspicuous and give the area a more contemporary appearance. The concrete floors, once covered with vinyl tile, were stripped and acid washed to reflect the new warm orange and cool green color scheme. Wright says the trapezoidal "bow-tie" that floats above the conversation area is one of his favorite elements. This detail, created by joining two ceiling-mounted contrasting-color triangles, has recessed lighting. "All of the details used for this project were very sharp, very high quality," says Wright. "That really comes through in the finished space." When Robert Clarke, owner of CBI Design Professionals, a design/build firm in Southeastern Michigan, built this spectacular lakefront home seven years earlier, he says he knew his clients planned to add a pool in the future. "What I did not anticipate was the extent that they would take it to," he says. The client's pool is incorporated into a new addition, a spectacular below-grade pool house constructed in similar fashion to a concrete envelope, says Clarke, who designed and built the one-of-a-kind project for the homeowner, who is a local concrete contractor himself. The luxury home sits on a hillside site that affords its owners lake, nature preserve and wooded views that they did not want to sacrifice for their 1,697-square-foot pool house addition. "Since preserving the view was paramount, we decided that the best place for it would be on the same level as the home's walkout where it would have the least impact view-wise." To accomplish this, the pool was excavated 12 feet below the home's existing foundation walls, which required substantial shoring and engineering work. "The water level of the pool is actually two feet below the basement floor height," says Clarke. "We had never done something like this before." The ceiling coffers are all formed concrete and the walls are finished with drywall backed by a vapor barrier. Multiple windows in the pool room ensure that it has beautiful views of its own. The pool house itself was constructed of formed concrete poured in similar fashion to the way a commercial structure is built, Clarke says. "We had to be very careful when it came to waterproofing the structure because the interior wall was never going to be exposed." The roof of the pool room is a combination of cast-in-place concrete vaults and concrete plank; all were waterproofed. Interestingly, the room's ceiling serves as the base for a patio and lawn above it. Skylights incorporated into the lawn area above the pool room flood the below-grade space with natural daylight. Small openings in the concrete beams, which contain the skylights, are connected to the room's air handling system so that the windows are continuously bathed in a stream of warmed, dry air. "This eliminates the possibility of condensation on the windows and 'rain' inside the room." The pool house features its own air handling system that recycles the air, keeping the odor of pool chemicals out of the main house. "You can't even smell chlorine when you stand next to the pool," says Clarke. Because the ground temperature at this level stays at a constant 50 degrees, temperature fluctuation was not a major concern. "We had to overcome some significant engineering challenges for this project but the results were really remarkable." Remodeler and Designer: Daniels Design & Remodeling, Fairfax Station, Va. The run-of-the-mill 1980s-style kitchen in this production-built home in Centreville, Va., was transformed from ordinary to extraordinary. The 10-month-long remodeling process involved not only new cabinetry and high-end appliances, but also big improvements in its space planning and visual connections. "This project is actually the starting point for a work in progress," says Edward (Ted) Daniels, president of Daniels Design & Remodeling in Fairfax Station, Va. "The homeowners wanted to create a true custom kitchen that was elegant but still warm and comfortable. At the same time, the wife expected this project to set the standard for her future plans when it came to improving other areas of the family home." This kitchen remodel presented two complex construction challenges that were effective and economical, Daniels says. The first was the development of a custom support system, which consisted of an "invisible" structural load-bearing column installed in a void in the new cabinetry, replacing a load-bearing wall that had to be removed to widen the space. The second involved reconfiguring a large mechanical chase containing an air return duct and a flue that obstructed one wall. The air return was rerouted from the basement into the foyer area. Use of a shallow, but wide, duct system minimized the soffit in the basement and maximized air flow. A new HVAC system, with a built-in power ventilator, was installed to address the issue of removal of the flue. The new kitchen features a variety of rich colors and textures that give it an old world elegance which is far removed from its plain predecessor. The counter surfaces include a mix of granite, tile, marble and wood. The firm also relocated the main-floor laundry room to the basement, and incorporated a more functional, family-friendly mud room instead. The transition between the kitchen and adjoining great room had originally been partially blocked by a staircase that serves as a secondary access to the home's upper level. This staircase was removed and replaced with an open, circular one. Daniels credits the success of the project to a team effort, which included everyone from his on-staff architectural designer to the cabinetry and interior designers to the carpenters, as well as a homeowner who had a clear vision of what she wanted. Their innovative ideas and cost-effective construction suggestions were key when it came to transforming the original narrow, cramped kitchen into the show stopper that it is today, he says. "This is a great example of what a talented team can accomplish. I am really proud of them, and my clients could not be happier." Developed for a pair of hip, young restaurateurs in Richmond, Va., this award-winning redesign transformed their bland, traditional kitchen into a polished contemporary workspace where they can relax together or entertain small groups of family and friends in style. Part of a whole-house remodeling project involving their 35-year-old home, the couple gave C. Mason Hearn Jr., president of HomeMasons, a general idea of what they were looking for but left the specifics to him. "The first things we ask our clients when we redo a kitchen is 'Tell us about your routine. How do you want to be able to cook in your kitchen? How do you want to be able to eat in your kitchen?'" says Hearn. "In this case, we had newlyweds who had not really developed a sense of that yet. The only things that they were very certain about were the high-end, stainless steel appliances and modern aesthetic that they wanted to introduce to the space. Most importantly, they wanted the kitchen to function better for their lifestyle, which was very casual." The original kitchen comprised several small areas that did not work well together. Hearn replaced a poorly constructed, previous addition, which included a mud room and powder room, with a bright and cheerful breakfast area. "The original floor plan was very chopped up, and there was not much light getting into the kitchen. We took all of these little spaces and rebuilt them as a single area that now flows into the kitchen." A large window on the new exterior wall floods the space with natural light. Strategically positioned, translucent glass panel doors prevent the rich color of the cherry cabinetry from making the kitchen too dark. Reorganizing the cabinetry in the working portion of the kitchen and adding a center island more than doubled the amount of available storage and counter space. In addition to professional-grade appliances, the new kitchen features a sophisticated palette of colors and textures, including burgundy-stained cherry cabinets; stainless steel hardware; deep-profile, engineered-stone counters; and African slate flooring. Translucent glass panel doors in the upper cabinets and a bright white ceiling keep the room from becoming too dark or looking overly commercial. "In a way, this project was a restoration of the original fabric of the home," says Hearn, "because we were able to remove previous inappropriate work and replace it with an addition that is much more style-appropriate. The new kitchen is much better organized and much better suited to the clients' lifestyle. Besides, no home is complete without a kitchen that really looks good." Remodeler and Architect: Design Construction Concepts, Northbrook, Ill. When the owners of this contemporary, 10,000-square-foot custom ranch in Highland Park, Ill., decided it was time to update their personal space in their 20-year-old home to better suit their empty-nester lifestyle, one of the key areas they wanted to improve was the appearance and function of their master bathroom. Design Construction Concepts, a full-service architectural design and management company located in Northbrook, Ill., was actually the second contractor that the couple had hired for the project, says Principal Michael Menn. "We actually came in after the initial demolition was already done." The overall scope of the project involved remodeling and enlarging the entire master retreat and adding a den. The master bathroom portion of the project presented Menn, also a registered architect, with an interesting design challenge. Each of the spouses wanted to have their own personal space in the bathroom, as well as a central sitting area with a large soaking tub. "This was a very regimented couple with discriminating tastes," says Menn. "Their privacy was very important to them but they also wanted their bath to provide them with the opportunity to display pieces from their extensive art collection, including paintings and sculpture." Menn's plan was to create a contemporary and luxurious bathroom for his clients that would be both compartmentalized and spacious at the same time. "I wanted to avoid dividing the area up into a number of closed-off rooms." Translucent-panel glass doors separate the master bathroom from a new walk-through dressing area. His solution was to use half-frosted, half-clear glass partitions as walls flanking a central tub to create separate his-and-her water closets, one of which included a toilet and bidet, and the other a toilet and urinal. A triple-panel window above the soaking tub brings natural light into the room and provides the clients with a wonderful view of their heavily wooded, two-acre home site. Menn also encouraged the couple to incorporate universal design features into their new bathroom including low profile toilets, a curbless shower and decorative, but strategically positioned, grab bars. As the result of their unhappy experience with their previous contractor, the couple was insistent that all access to the work area be restricted to the rear exterior of the home. "They did not want workmen to be walking directly through their home. This meant that we had to install, and then later remove, a 250-foot gravel access lane that ran from the driveway to the construction site." "The client's new bathroom meets their lifestyle needs and provided both the privacy and shared space that they were looking for." The new vanity and mirror were custom designed and built by the remodeler and feature a lacquer finish that complements the granite counter and travertine vessel sink. The new wall texture features tissue paper applied with wallpaper paste, a base coat of paint, and a metallic faux finish followed by a hand-rubbed laquer glaze. Although they had recently remodeled much of their home, the owners of this 35-year-old traditional ranch realized they still had one key space left to address: the guest bathroom. Not only were they unhappy with its dated appearance but also with the safety issues presented by its sunken tub. The homeowners, who frequently entertain overnight visitors, including their aging parents, had grown concerned about just how accessible the sunken tub in their secondary bathroom was for their guests. "They wanted to make the facilities easier for everyone to use as well as do all they could to prevent accidental falls," says Robin Mathews of Curb Appeal Renovations, who co-partners the Keller, Tex. design/build remodeling firm with husband, Rob. "We had been responsible for remodeling other areas of this client's home, and they came back to us a year later for suggestions on how to re-adapt their bathroom to make it more practical and convenient for their guests." The project was a straightforward one, says Mathews, involving upgrading the fixtures and finishes as well as replacing the tub with a large step-in shower. Not onlly is this remodeled bathroom spectacular to look at, but the new step-in shower is much more practical than the sunken tub that it replaced. The original slab foundation beneath the tub was sunken to accommodate its extra depth. Once the tub was removed, the plumbing was rerouted to create a central drain for the new shower, and concrete was poured to bring the floor level up to the rest of the room. The firm incorporated a modest slope into the new floor to facilitate drainage. Finally, a sliding, framed shower door unit was mounted on the three-inch curb that separates the shower from the rest of the bathroom. Mathews, who has a degree in interior design, worked closely with the homeowners as they made their selections for the new finishes and fixtures for the remodeled space. "They really wanted it to have a "wow" factor. Generally, I don't pick out things for my clients, but I do try to guide them. I want to make sure that they consider how the space is going to be used so that they make choices that are appropriate for the project. I don't want them to be unhappy later on." The remodeled bathroom is not a true barrier-free project because the shower is not a roll-in design and the room is not large enough for the required 5-foot turning radius necessary to accommodate a wheelchair. "But it is so much more functional and beautiful than before," says Mathews. "Working on it was so much fun." A 45-degree wall provides privacy between the toilet and shower areas within the bathroom’s open design. “It was a real challenge to get all the mortar beds to work with all of the things that were going on in this space,” says remodeler, Walt Lytle. Although this Elk Grove, Calif., home had been custom-designed for its owners nearly 30-years earlier, the master bath no longer functioned efficiently for the wife, who had been diagnosed with a degenerative disease that left her dependent on the assistance of a caregiver for the majority of her daily needs. The goal for this remodeling project was to make the master bathroom more functional for the homeowner's personal use while enhancing the resale value of the home itself. "We wanted to use materials of today to create a functional, modern space in a style that was still appropriate for the home," says remodeler Walt Lytle. "My client came to me with concept drawings that he had created himself showing how he wanted the remodeled bathroom to look and function," says Lytle, whose Sacramento-based firm received a 2007 CotY award for another universal design bathroom. Lytle says that he collaborated closely with his in-house design consultant, Rebecca Chappell, for this project. Universal design features included replacing the tub/shower combination with a roll-in version in which the whole floor slopes toward a main drain; strategically position the grab bars and electrical outlets; widening the doorway and replacing the door itself with a lockable, pocket model; and using large pulls on all drawers and door handles. The roll-under sink was designed and custom-built to meet the unique needs it is still fully functional for the rest of the family – or different owner – to use. The homeowner's desire was that the entire room be completely watertight so no water would permeate the home's wood framing. "They initially wanted the whole room, including the ceiling, to be tiled," says Lytle, "but we were concerned that this would create too much of an institutional look." A water-resistant plaster ceiling was installed instead and the tile, while still extensive, was downplayed. Creating a true wet room proved to be the most challenging element of the project, the remodeler says. "We installed new 78-inch mortar bed throughout the bathroom, including the floor, walls and ceiling. That is a lot of extra weight." Extra foundation piers and special lathing were added to increase structural support. Lytle designed a mock-up lavatory for the homeowner and, with her assistance, identified the best placement for any items that would enhance her independence. This included a roll-under sink, which was designed and fabricated in the remodeler's shop. Because her left side is stronger than her right, a faucet with a lever control on the left was chosen. This remodeled bath passes the test of true universal design with flying colors. Lytle says although it is functional for the wife, others are also able to use it with comfort and ease.